I think it’s safe to say that asparagus is my favorite vegetable. 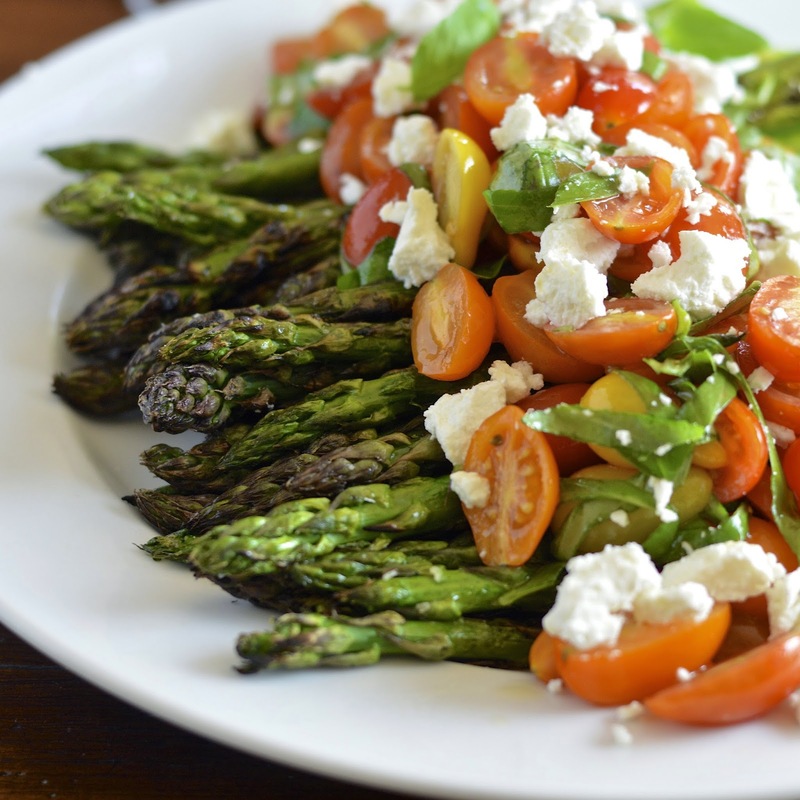 This grilled asparagus with a tomato, basil, goat cheese salad combines two of my other favorite flavors; fresh tomatoes and basil and goat cheese. The combination is killer. 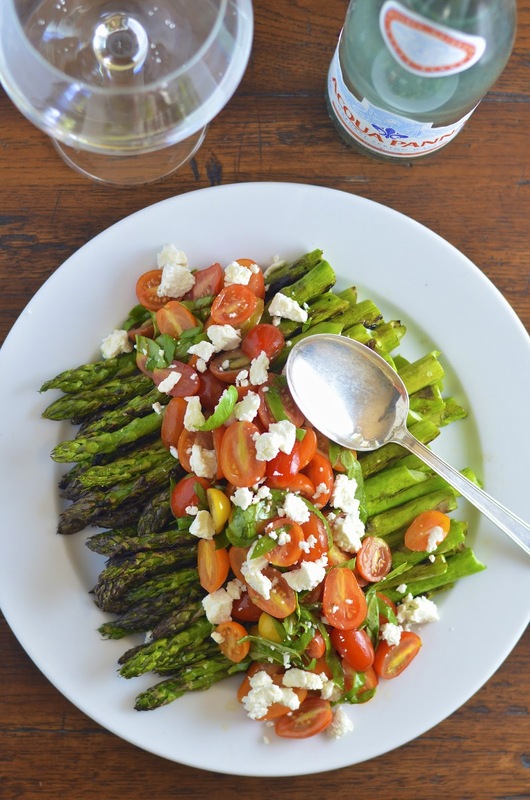 You have your smoky crisp asparagus, topped with a tart and herbaceous salad, finished off with creamy goat cheese. This is a happy and healthy mouth explosion of flavor. I know – that probably makes no sense! I'll be back on Friday with the perfect Mother's Day cocktail - see you then. Remove the tough end of each asparagus by snapping it at it's tender point towards the bottom. Lay the asparagus out on a sheet pan and drizzle with the olive oil. Turn the spears until they are well coated with oil and sprinkle with kosher salt. Spread the spears out on the hot grill and cook for 6 to 8 minutes, turning once or twice, until asparagus is tender and lightly charred. Remove from grill and set aside. In a small bowl whisk red wine vinegar, oil and salt. Add tomatoes and basil and stir until completely combined. 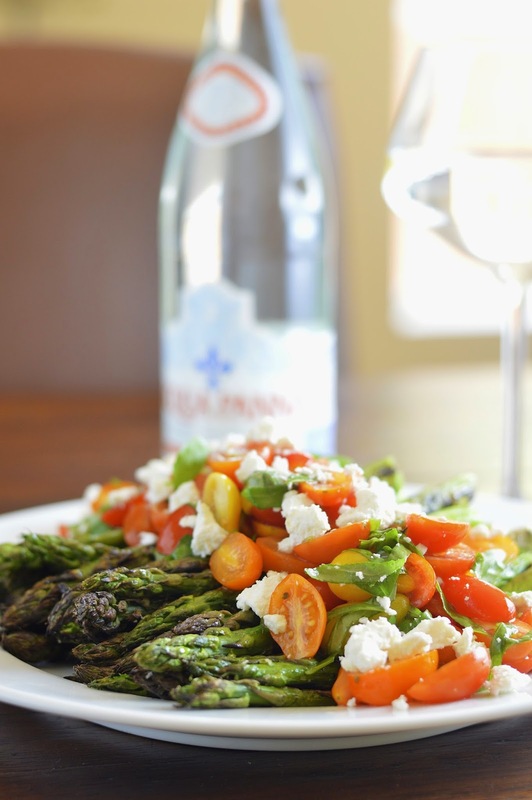 Place asparagus on a platter and top with tomato mixture (down the center of the spears). Sprinkle goat cheese on top and ground black pepper to taste.